Mary Bonina was a guest on the "Speaking Voices" radio show, a production of Audio Journal. The program is aired in Massachusetts and the Chicago Area. Originally aired on Tuesday, September 5, 2017. Bonina has a group discussion about her memoir, My Father's Eyes. Mary Bonina collaborated with composer Paul Sayed on Grace in the Wind, a piece that celebrates mothers, writing a set of three poems commissioned by the composer. In May 2012, they previewed the project at the "New Music by Longy Composers" concert. 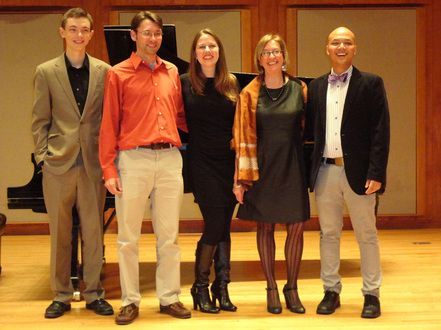 Thanks to the magnificent artistry of soprano Caitlin McCarville, cellist James Rosamilia, and pianist Danny Padgett, the performance was received warmly and generated much anticipation for the completed work. Grace in the Wind premiered at Edward M. Pickman Hall, Longy School of Music of Bard College, Cambridge, Massachusetts, on Tuesday evening November 27, 2012, and was enthusiastically received. An audio recording of Mary Bonina reading her poem entitled "Mountain Road from Roseau." Roseau is on the island of Dominica in the Caribbean. It is among the least developed of the Caribbean islands -- not the touristy white sand beaches, but mountains and rainforest. The poem resulted from a trip, with her husband and son, to visit a friend who lived there. Below is a segment "On Place in Poetry" from an interview with Mary Bonina by Hajar Jafferji for Worcester Area Writers Project at Worcester Polytechnic Institute. Other segments can be seen on youtube, and they include: "Explaining her Early Career," "On Current and Upcoming Works," "Tips on Writing," "Poetic Influences, "On Danehy Park," "Reflections on Her Father and Her Work," "Aspirations," "Describing her Memoir, My Father's Eyes."